Greensource President Ez Housh transformed this Eighth Street townhouse into a LEED Platinum showcase while maintaining its historic character. William “Ez” Housh III always had a soft spot for neglected historic beauty. But his renovation of an old brick townhouse in 2008 evolved into a very special type of project. He didn’t just restore the downtown home to its former grandeur; he transformed it into a showcase for green building design in Cincinnati. “It’s a passion of mine to pull things out of the gutter,” he said. When he bought the Eighth Street townhouse, it had sat abandoned for a decade. It had once been the home of a Cincinnati mayor, then an American Legion hall and finally, a lighting store. Housh completely renovated the building using the latest energy-efficient materials and heating and air systems. He added a green roof, high-performance insulation, a rainwater harvesting system and a gray water system to reuse waste water. In 2013, the project was awarded LEED Platinum certification by the U.S. Green Building Council, the first historic downtown building to receive that honor. It also won an award for Local Preservation Excellence from the Cincinnati Preservation Association. “It demonstrates that even a Cincinnati row house built in 1875 can reach the highest level of sustainability,” said Chuck Lohre, who worked closely with Housh on the project. His company, Green Cincinnati Education Advocacy, a division of Lohre & Assoc. 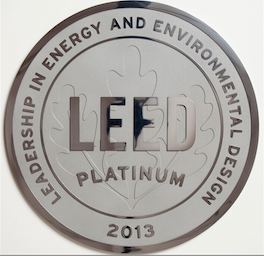 Inc., was the green building consultant and championed the LEED Platinum goal. Lohre has led hundreds of people on tours of the building, and it has inspired other green renovations. This award nomination honors Greensource Cincinnati for creating one of the most sustainable urban revitalization projects in the U.S. Greensource Cincinnati owns the sustainable built work, including complete building renovation, interior fit out, landscape, and an extensive set of state-of-the-art building systems including: reduced light pollution, occupancy sensors, programmable thermostats, measured and verified electrical systems, extremely low lighting wattage per square foot, the first integrated gray water toilet in Cincinnati, vacuum toilet systems, rainwater harvesting, geo-thermal demonstration systems, solar thermal hot water, solar electric demonstration systems, USGBC accepted renewable energy sawdust pellet stove and the first chilled beam AC system in Cincinnati. The built work has groundbreaking unique environmental, social and economic success stories, and has significant measurable sustainable attributes by achieving LEED Platinum. The project is listed in the USGBC directory as Eighth Street, http://www.usgbc.org/projects/eighth-street/. The Eighth Street headquarters of Greensource Cincinnati, an energy efficiency consulting firm, has been transformed into a showcase for green technology. In 2008, company president Ez Housh decided to buy an old building in downtown Cincinnati, renovate it to high standards for energy-efficiency, and give people a place where they could see state-of-the-art green building products in action. Over the next few years the 1875 brick townhouse opposite the public library was completely renovated with the latest in energy efficient building materials and HVAC equipment. Highlights include a green roof, high-performance insulation, the first rainwater harvesting system in Cincinnati and a gray water system that reuses waste water from sinks. Over the years, the building housed a series of businesses, including the former Ertel lighting store. It endured hard use, neglect and insensitive remodelings. The renovation preserved the graceful open staircase, the ornate plaster ceilings in the “1875 room,” and the wooden shutters that fold into pockets in the wall: an original green feature. Greensource was designed as a showcase for sustainable "Green Building" design in Cincinnati. Centrally located in downtown, the 1875 building was completely renovated with the latest in energy efficient building materials and HVAC equipment. The urban location provided benefits because of access to alternative transportation, location in a neighborhood with an average density of 142,621 square feet per acre and no need for additional parking, receiving 12/14 points. Water use reduction is extremely low because of the state-of-the-art gray water and rain water harvesting for sewage conveyance and low flow fixtures to reduce potable water use, receiving 5/5 points. The rain water harvesting system is the first in Cincinnati. From the high efficiency windows and the spray foam insulation, the building demonstrates very low air changes per hour. Energy modeling verified 34% improvement over USGBC baseline for HVAC performance, receiving 12/17 points. Rounding out this building's outstanding achievement is very high indoor air quality through the use of MERV 13 filters, 30% more fresh air ventilation and low emitting finishes, receiving 11/15 points. The project also earned 5/5 points for Green Cleaning, Green Education and exemplary performance. Ez Housh was the LEED AP on the project. Chuck Lohre was the Green Building Consultant and championed the LEED Platinum goal. Greensource provides visitors with information that will allow them to make informed decisions regarding energy and environmental issues that are important to the community, and country. The concept of sustainable development reflects an understanding that we must meet the needs of the present without compromising the ability of future generations to meet their own needs. Greensource not only embraces the concept of sustainability but is, in itself, a teaching tool for sustainability. With our environmental problems increasing at an alarming rate, the most effective way to demonstrate to Cincinnati what can be done to make a positive impact, is to incorporate educational messages in Greensource. By implementing green solutions into the project, visitors can see first-hand how actions at a local level can make a difference. It is more than just an interior environment. It creates a new type of learning experience for visitors by maximizing the physical and inspirational aspects of the building. Permanent comprehensive signage is posted around the office to inform occupants & visitors of sustainability initiatives/benefits. An electronic newsletter sent to all interested persons describing strategies, initiatives, and ongoing progress at Greensource. Of the thousands of visitors to Greensource Cincinnati, several dozen have gone on to register LEED projects. As the continuing, leading example of sustainable renovation in Cincinnati and with the ongoing events and educational classes, Greensource Cincinnati plans to influence the renaissance of revitalization in Cincinnati. 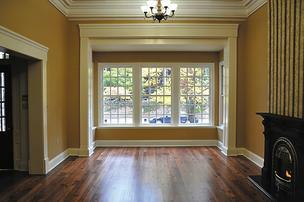 Tour this 1875 Cincinnati Mayor's home which achieved LEED Platinum in 2013. Presentation is for the Green Education credit for the U.S. Green Building Council's Leadership in Energy and Environmental Design.